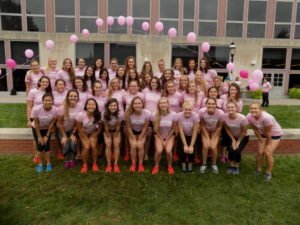 The Princeton Women’s Swimming & Diving program, in partnership with the Princeton Varsity Club, hosted its 9th annual Collegians Find the Cure 5K Run/Walk on Saturday, September 24th on the campus of Princeton University. Hundreds of runners came out to participate in support of the charitable cause, including various varsity teams. Princeton men’s swimming & diving member, Matthew Marquardt paced ahead of the runners with a winning time of 15:50. This year’s rendition benefited the Breast Cancer Resource Center, located in Princeton, New Jersey, that provides women with programs to help in their breast cancer journey. This years Collegians for the Cure 5K raised over $5,000. Total donations since the event’s conception in 2007 now exceed above $20,000.